KitMonsters – Roland TD-8. The music makers’ guide to making music. 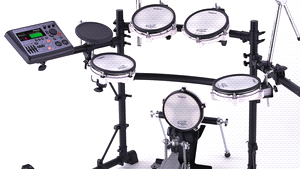 Mid-range compact V-Drum kit that’s good for recording as well as live use. The brain has a huge variety of drum and percussion sounds - 1286 - that can be edited. There’s a built-in sequencer which can play several parts at the same time. 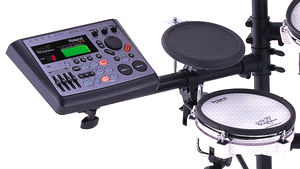 It includes trigger pads for cymbals and hi-hat, and a hi-hat controller to give a variety of sounds.